Okay, back on track here people. I hope this post will help you out, even if only to inspire you! Because sometimes a little inspiration is all you need. Or a crazy friend that somehow manages to talk you into joining her on an epic quilty adventure. Not that my rubber arm needed much twisting! Having already tackled Jen Kingwell's Gypsy Wife I was more than willing to jump head first into this project with Angie! So without further ado, shall we get started? 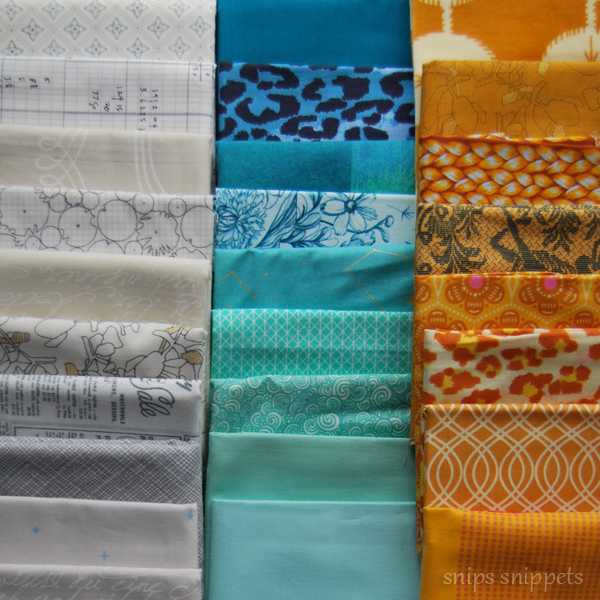 I'm going to start with how I pull and plan fabrics for a quilt, then move into some other ways to go about it. There's no right or wrong way to do this, so long as the end result is a selection of fabrics that you love. 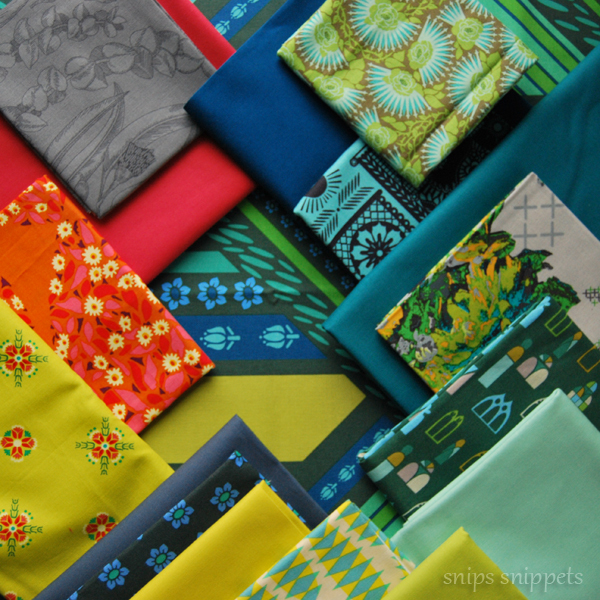 That being said, there are a few things to consider when putting together a pleasing bundle of fabrics. I almost hate to say this, but my biggest tip for those wanting to feel more confident in their fabric pulls is to practice. Make stacks of fabrics. Lots of stacks! At any given time I have at least four or five random stacks of fabrics in my sewing room with no plans for them whatsoever! 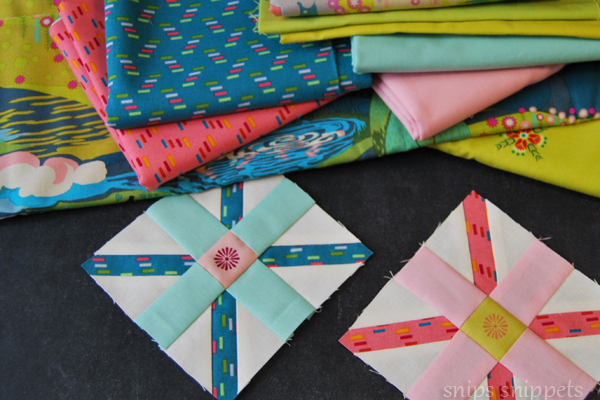 Just take a few minutes out of your day and go into your fabric stash and make a quick bundle. Even just five fabrics. Do it now! Wait, not now... I still have more tips! After reading this, I challenge you to make a bundle! The more you do it the easier it gets. I seriously just ran into my sewing room and made this bundle below when I realized I didn't have a photo to share here. Five minutes. Five different designers and yet, it all works. I'll come back to this stack in a minute and explain why I think it works, you may have a different idea of why it works. Or maybe you don't think it works at all! I would love to hear your thoughts on this so please feel free to comment below! For those of you that are still not confident or comfortable pulling fabrics you don't have to. Pick a designer that you love. And use just a line of their fabrics. Take my favourite designer for example, Anna Maria Horner, I bet none of you knew that AMH was my fave, it's not like I make all the quilts that are staying with me out of her fabrics! Okay, here's a bundle of her Mod Corsage line. Take one colourway of the bundle and pair it with some solids. Easy peasy. All you need to do is just colour match the prints to your solids. 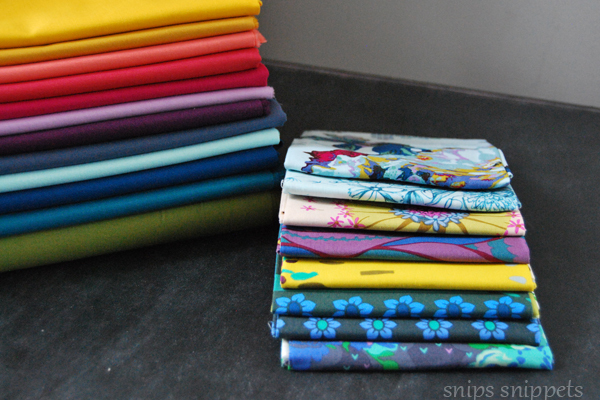 This stack of solids is one that I curated for my Long Time Gone quilt and FreeSpirit were kind enough to send me. 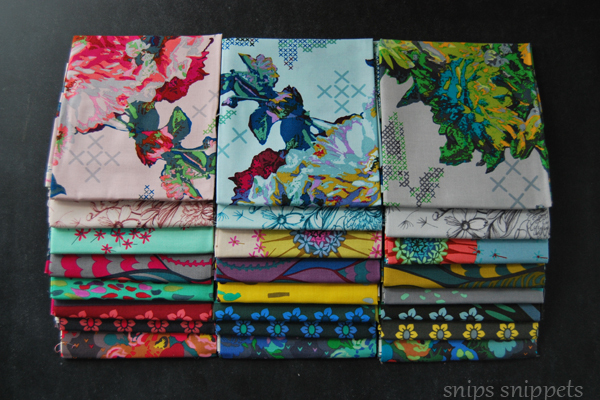 I I've chosen the colours based on some of the AMH prints in my stash. So for you AMH fans out there I can supply the colour info if you're interested! So there's an easy way to start. But if you want to get right into it, here's how I roll. For me it almost always starts off with what I like to call my "jumper" fabric. AKA the "jumping off print". This is your main print, the fabric you absolutely love. For this example I'll use this print from Anna Maria Horner, this is one of my favourite colour palettes! Okay, back to business. That little row of colourful circles on the selvedge of the fabric is magic. It is all the colours used in the print, this is where to go to pull matching colours for the rest of your fabrics. This is the first pull I came up with for this print - Passage in Forest - Now I've changed things up a bit. I'm still using all fabrics from AMH, but from multiple lines. That's the beauty of sticking with one designer, the collections, for the most part, will all go together. I've kept the colour palette analogous, meaning I've kept it to colours that are all next to each other on the colour wheel. Blue, blue/green, green/yellow. But I saw that little pop of coral/pink on the left and thought, hmmm I wonder what would happen if I added some of that in. BLAM! The previous pull is still a gorgeous palette, but this way has just that little bit of extra oomph! So try that. 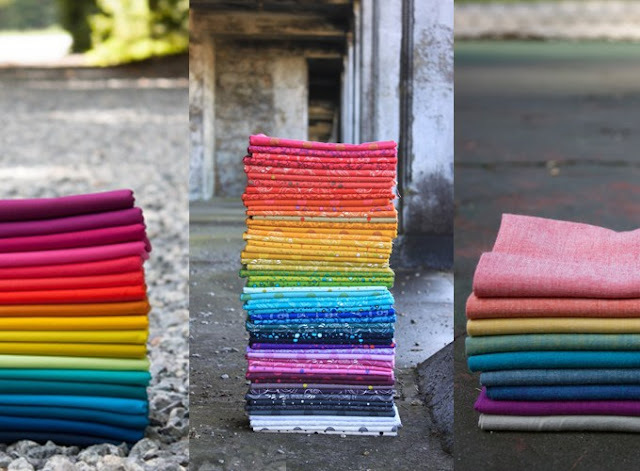 It's easier to put together a bundle of fabrics that are all more closely related in colour, but then add in a print or two from the opposite side of the colour wheel. It just punches it up a bit. The next pull I did I started with this print as my jumper. And here's the first pull I put together for it. Now, for a lot of people this pull would come off as slightly out there. Still all AMH prints but a really wide variety going on here. I personally love it, but when you're pulling for a specific pattern you need to keep the pattern in mind. How big are the pieces you will be cutting for it? What size are the blocks? You want to try and have different scales of patterns in your prints. I did a second reworking of this pull and found that I like it considerably more than the first. The pink in the top left corner was a little to bold in such a large quantity and I wasn't overly fond of the print on top of it, it was also coming off as too bossy for this pull. All making sense so far? Good! 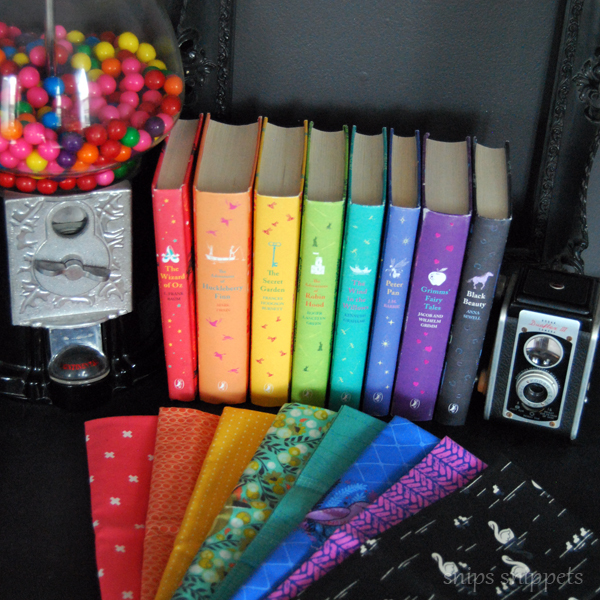 This set of Puffin Classics sits on a shelf in our living room. I see them everyday and have wanted to make a quilt based on their colours for years now. Rainbow, but not primary rainbow. So I grabbed the lot of them and took them into my sewing room. Fifteen minutes later I had discovered two things, one, I have a seriously non existent selection of purples and purpley blues. And two, I need more hours in the day so I can develop this into a project! You needn't be so literal with the pull as this though. These colours are pretty bang on and as much as I like it, I think it would be a more effective pull with varying shades of each colour. Hmmm, no. I do not have time for this project. Filing for a later date! I also wanted to show you how to use a piece of art as inspiration. 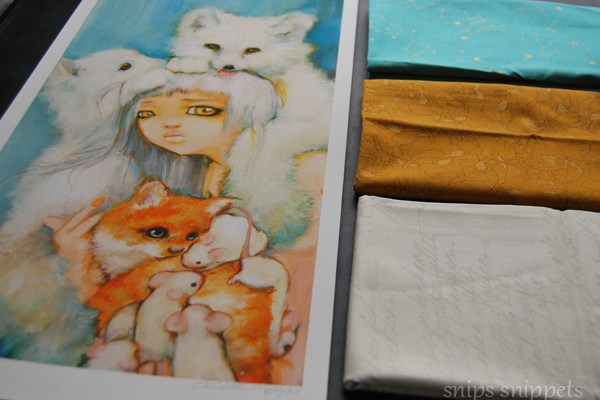 The print below is by one of my favourite artists - Camilla d'Errico and the colour palette is one that I just love. So I started by pulling three prints in the three dominant colours. I decided to go with a more gold print than orange, only because I prefer it to orange and for me it still gives the same overall warmth that the orange does. Once I had the my three dominant colours I went through my stash and just started pulling everything I could find in those colours. There were little bits of pale pink in the painting so I added in some prints that had bits of pink in them. This is another easy way to pull fabrics. Focus on a few colours and just gather what you can that match. Don't overthink it. Your eyes will tell you if something isn't right. But before pulling that piece that doesn't seem to work out, try placing it next to a different fabric. Sometimes your eyes just don't like the way one colour looks next to another. if you space them apart though they can still get along in the same quilt! This method works well if you want to use a variety of designers. Which brings us back to this photo. Again, five different designers. The typewriter print was my jumper in this selection. 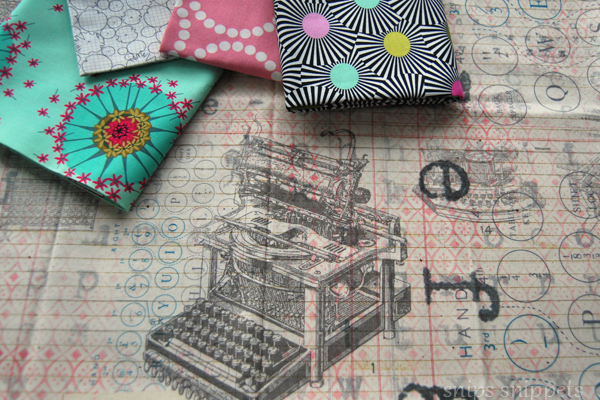 I pulled the AMH floral next, noting that the aqua and pink pulled out the pale pink and teal in the typewriter print. The Lizzy House Pearl Bracelet print came next. And when I pulled it I noticed I was unknowingly pulling prints with circular motifs that played on the circles in my jumper print. So I ran with it. The Carolyn Friedlander botanical print was next, and then I just had to add the Tula Pink burst print. More circles, the colours play well enough and I just love adding in a strong graphic element. Especially when the original print is more soft. How we making out so far. Everything making sense still. Taking notes? The quiz at the end is a doozy! Kidding, just kidding. The test is tomorrow. Next on the agenda, ever so briefly, choosing your background fabric. One of the reasons I love Jen Kingwell's patterns is for the scrappy chaos that can be achieved. She is the master of this type of quilt! There's no right or wrong here when it comes to choosing. You don't even need to choose a background if you don't want! Go 100% scraptacular! That's the beauty of this type of quilt. Make it you, pick what you want, don't pick what you think the masses are going to like, trust me, with the amount of work you're putting into it, make it everything you want it to be! Honesty island here again friends, I had already started making my blocks with the cream background when FreeSpirit sent me this little bundle of awesome. Don't think that I didn't consider restarting my project and using this as my background instead. Truth be told, I'm honestly thinking about starting a second one using them. Would that be crazy? Crazy awesome! Challenge accepted! No, no, no... I don't have time to make two of them. Or do I? So there you have it. A glimpse to the inner workings of my mind, madness in there people! I hope you've picked up a new trick or two and will forgive me when I tell you that for this quilt I have no jumper print, I've completely no regard for the scale of any of the prints I'm using and there is absolutely no consideration placed on what colours/fabric I'm using in relation to where the blocks fall in the quilt. I told you I don't often follow my own advice! I am however using all Anna Maria Horner's fabrics, so I'm absolutely confident that it will all be fine in the end. And though this isn't my first all AMH quilt, this is the first one where she's been involved with the project. Like she's emailed me, personally, herself, type of involved. So you'll have to forgive me if I on occasion go all fangirl during the sew-along. I'll try keep it to a minimum. but really, it's AMH!!! Truly though, it's been wonderful working with both her as well as FreeSpirit Fabrics for this event. It's nice to work with companies and people whom I respect and admire. 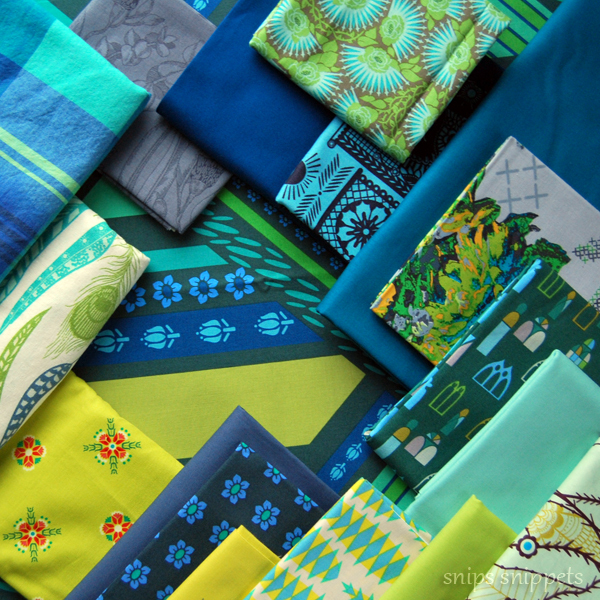 So how have I decided to choose fabrics for my quilt you ask? Well let me tell you, I've been choosing my prints and colours based solely on each individual block. I did this the exact same way when making my Gypsy Wife and I'll admit I wasn't sure it would work just randomly choosing fabrics. In the end though it was all love. It to this day is still my absolute favourite quilt, we'll see though, this one may take the lead! 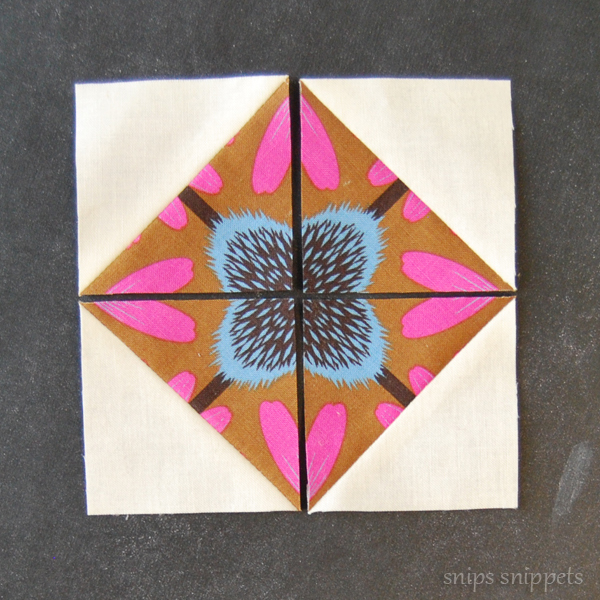 I should also mention that I will be trying my best to fussy cut and kaleidoscope piece as many blocks as I can. Not all, but at least some of the larger ones! This one didn't make it into the block, it was actually just off cuts. I may find a way to squeeze it in somewhere yet! I'll get into more details about how I'm doing this later on in the sew-along! Now, I have a very (ahem) extensive collection of AMH prints, that I have been "curating" for the past few years. 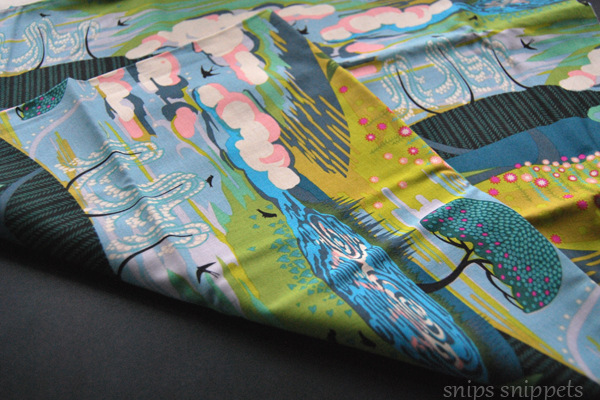 This is giving me the luxury of having exactly the print/colour/saturation, etc... that I need for this quilt. If you are looking to make yours in a similar style as mine I have some exciting news! Anna Maria has curated a special bundle just for us!! "I've created this special stack that is a mix of soft and intense tones to support the Quilt Along project of a few of my friends! The Long Time Gone quilt by Jen Kingwell is the inspiration behind the project, quilt along and this palette." *Please note this stack or yardage does not specifically correlate to any exact requirements for Jen's pattern, but is meant to boost your stash! 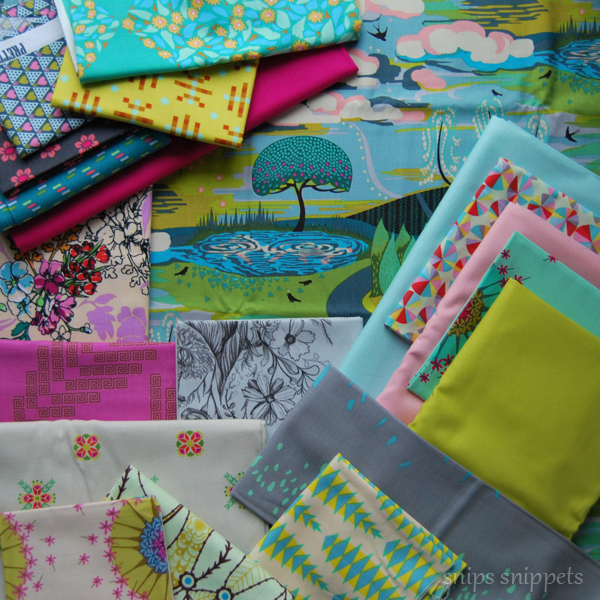 You may also want to check her the rest of her shop, so many gorgeous bundles and fabrics to be had! Click here to get all the AMH awesomeness! Anna Maria has also very generously provided a discount code for this event, use “longtimegone” between now and Valentine’s Day (February 14th) and you’ll receive 20% off your order. Conditions apply, please see Anna Maria Horner’s site for further details. If you like the idea of using all one designer I have another option for you that is just as delectable! My partner in crime Angie is going the same route as me using all one designers fabrics. She's chosen to make her's entirely in Alison Glass fabrics and I have to say, her blocks are so gorgeously bright and saturated! You're going to love them! 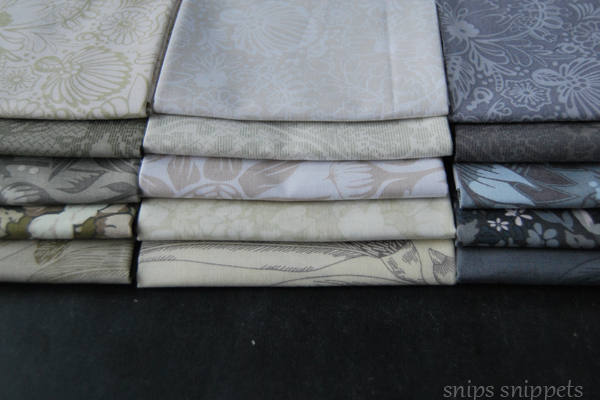 We love the quietness of the background of the cover quilt and this bundle will work great if you want that look. 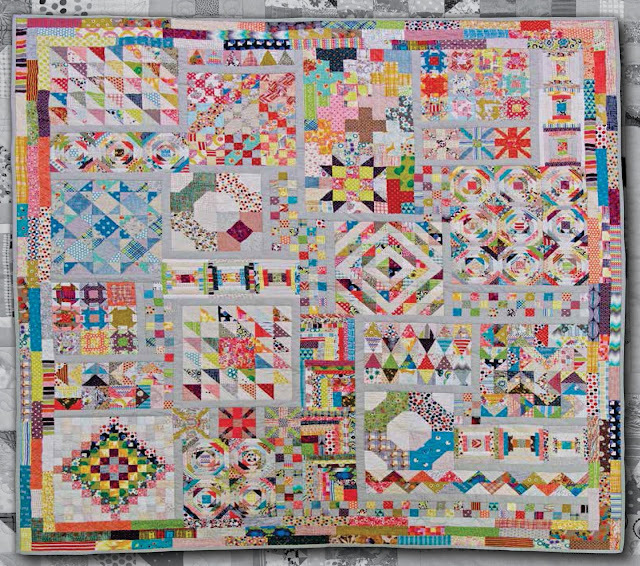 It is made up of 14 fat quarters of Alison’s pretties lights across multiple collections. We’ve never offered fat sixteenths before and thought it would be super fun to give it a go for this bundle. You’ll get a ton of small cuts of lots of brights – 62 in all – across multiple recent AG lines. Alison’s has chosen a group of many of her favorites that we think you’ll love. This bundle is one of each of the above! 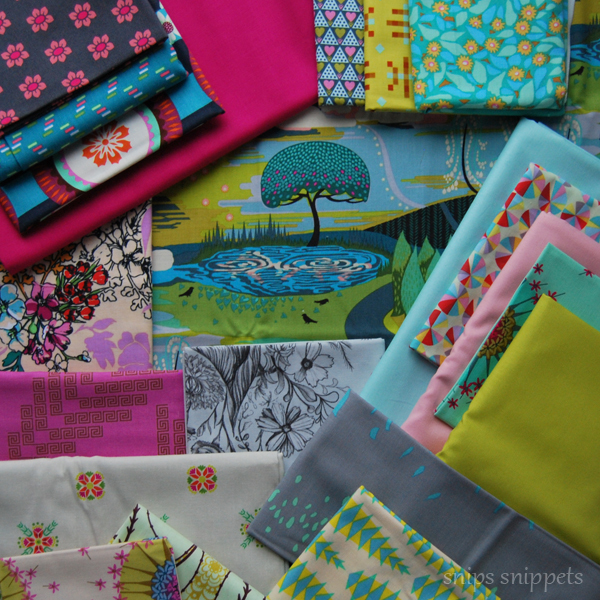 Don’t forget to check out the other fabric bundles available through Alison Glass Studio. You can find them all by clicking here. Alison Glass has also offered up a discount code for these bundles, so to get that make sure you’re signed up to Angie's newsletter (you can do so by clicking here) She'll be sending it out in the next 24 hours and then again on Monday 30 January 7:30am AEST). This kit includes 64 different fabrics. Most of the fabrics are from the Long Time Gone Block of the Month Club from 2016. All fabrics have been hand picked by Jen Kingwell so you can rest assured you’re going to get a quilt that looks like Jen’s. This kit includes 32 different fabrics. Most of the fabrics are from the Long Time Gone Block of the Month Club from 2016. All fabrics have been hand picked by Jen Kingwell so you can rest assured you’re going to get a quilt that looks like Jen’s. You can add the pattern to your order for $25AU. Amitie Textiles does shipping, so be sure to drop them an email if your shipping option is not included. And that my friends is it! I mean I could keep talking about fabrics, I would love to in fact. But you're probably wondering how to shut me up at this point. So I'll end by saying again, make the quilt that you love, not the quilt you think other people will love. And thank you for trusting Angie and I to take you on this adventure. You have no idea how happy it makes us! 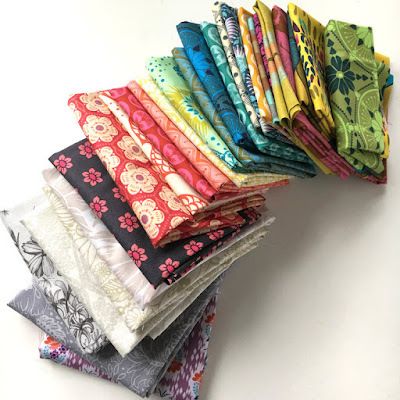 If you haven't yet done so, pop over to Angie's blog, she sharing her thoughts on picking fabrics and wow! Lists people, she has all the pro and con lists you can imagine! 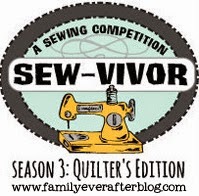 To find out more about the Long Time Gone Sew-along, including prizes, sponsors and where to get your supplies, click here. High fives to my partner in crime Angie, to my new BFF Anna Maria (ahem), Alison Glass, Jen Kingwell and to all of you that are coming on this crazy adventure with us! Your quilt is amazing already and you've only just begun!!! Very helpful and informative post, I especially love the photos! When I first saw this quilt, trying to think of what fabric to use was overwhelming! After having read this post I feel confident I could do it! It will be fun watching your quilt grow! Thanks for the color inspiration!!! I love this! Thank you for taking the time (and photos) to show how you do this. I find fabric selection really daunting - you made it look far less scary! Hi! You're a no reply blogger so I hope you pop back over to see this! It can be daunting to choose fabrics, especially for projects like this when there's going to be a lot of work going into it. But I'm glad I could help and just keep practicing. It gets a lot easier with time! Well Nicole, you guys have me hooked. 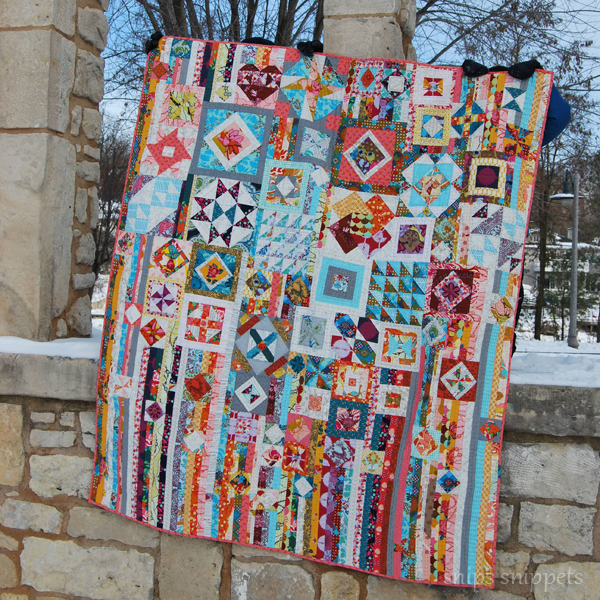 Love the look of this quilt so just ordered the pattern and the bundle of fabric from Alison Glass Studios. I am sure I have lots in my collection to complete this quilt but that fabric line will help make it pop for sure. Can't wait to start, so exciting. Yay!! I'm so glad you've decided to sew along with us! 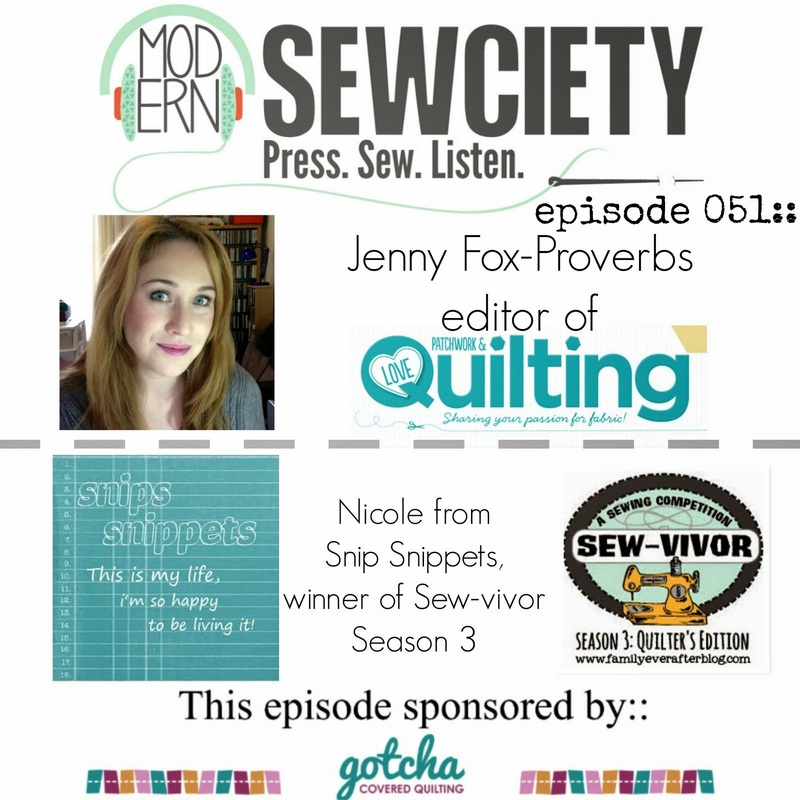 It's going to be fun and I can't wait to see everyone's blocks and quilts popping up! I've replied here because you're a no reply blogger, so I hope you stop by again to check! 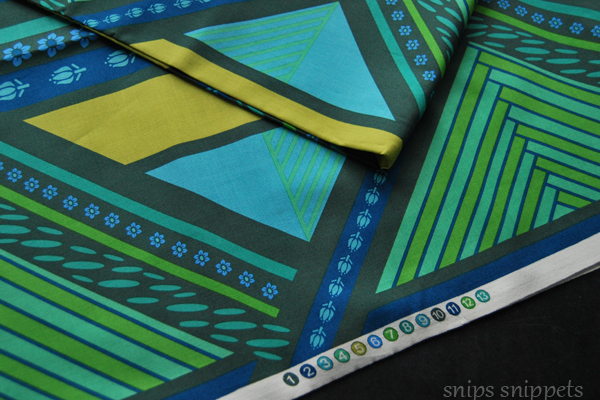 Hi, I love the bundle of solids that you have to match the AMH fabrics, can you share what they are? I bought the AMH bundle and I'd love some solids to go with it! Thanks! Hi! I've updated the last photo on this post, it includes all the FreeSpirit solids I'll be using! Hope this helps! I ordered the bundle from Alison Glass and love it! I'm a new fan! Can't wait to get started on this sewalong.